In the recycling industry, we offer the AKUPRESS AS screw press. This type of screw press was designed for dewatering in plastic recycling processes, to separate household, organic or restaurant waste, supermarket packaged food, food industry off-specification batch food etc. In general, the AKUPRESS separates a liquid or pasty phase from a well-structured coarse solid. We optimized the function and design of the press concerning the individual fields of application, allowing thus a safe operation even in cases of inhomogeneous feeding. Here we build on the experiences gained from more than 700 AKUPRESS units sold and delivered. In addition to the individual components, we supply a comprehensive range of machinery and equipment. Our portfolio includes complete turnkey systems together with all relevant process control technology conveying systems and catwalks. The AKUPRESS screw press reaches high dry contents. The user controls the dewatering process by adjusting the screw speed and the counterpressure that a pneumatic cone exhibits against the material outlet. As the screw is supported on both sides, it has a very stable position which minimizes wear. The flanged screw and the exchangeable screen basket system make maintenance easy. It is available in five different sizes with screw diameters ranging from 250, 315, 500, 625 and 800 mm. 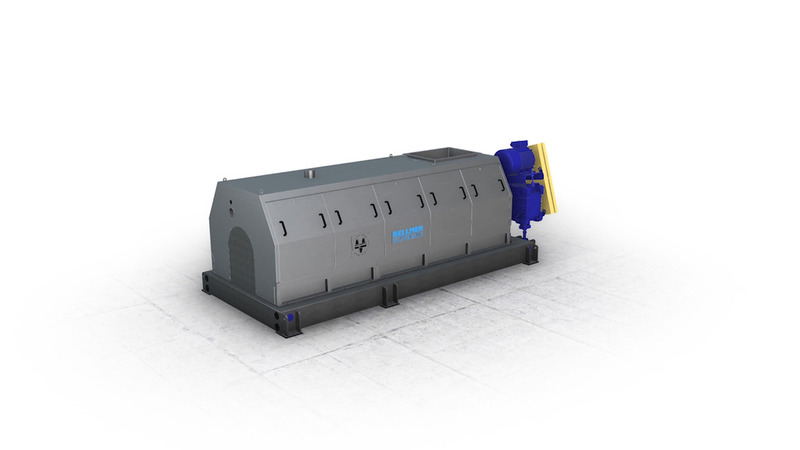 The larger models are for dewatering of washed film plastics before extrusion and provide sufficient capacity even for the largest recycling lines, while the smaller models are mainly used for rejects from the washing process. Our screw press specialists are looking forward to taking care of your next dewatering project. Learn more about our various screw press applications in the plastic recycling industry.